We are a family owned and estate winery. Not very many people can say that here in the US. The Jones family started out as growers and transitioned into the winemaking side of things 15 years. We are on of the few wineries in the state that grow our own grapes, make our own wine as well as having a custom crush facility. 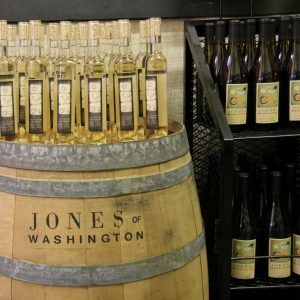 We currently have 17 different wines under the Jones of Washington label. We have a wide selection of offerings, but with a focus on Bordeaux varietals. In the past our Cabernet Sauvignon has recieved some really nice press. Currently our white wines are getting some nice recognition as a majority of them come from an up and coming AVA here in Washington, the Ancient Lakes of Columbia Valley AVA.